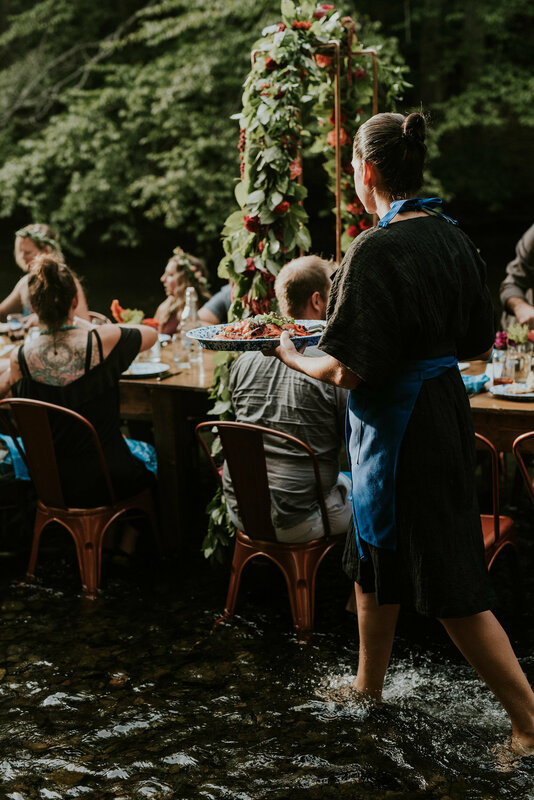 Late this last August, The Bacon & Lox Society hosted its second annual Full Circle Meal, immersing our communal table within a secret creek in Northeastern Pennsylvania. Having opened our creative process to include even more collaborators, we nearly doubled our event and wound up welcoming 50 guests! We decided to build on what resonated last year, deepening the traditions we established, and opening our process to include more collaboration. The “Full Circle” dinner experience is designed specifically to give back and provide replenishment and inspiration to the people who are themselves always creating beautiful experiences for others. It’s an exercise in radical generosity, because the entire experience literally comes together in the moment, with everyone’s help. It’s alchemy! Magic. From the get-go, our “Call for Collaborators” was one that emphasized community over competition. Different collaborators, each accomplished in their own fields, were given a style guide and the freedom to create the pieces they thought would contribute something to the experience. Trust was essential, and so was respect. The only restriction in this creative process were the limitations of being in a remote natural environment without potable water and electricity. It was exciting to see how each artist embraced this and used it to create a true sense of place. Another way we carried this tenet of community all the way through was by creating “credit cards” that referenced each contributor’s social media handle. I enjoyed seeing diners tagging their Instagram photos with the artists whose contributions made it what it was. Guests’ use of the event hashtag #BLSCreekDinner even helped four would-be attendees who were stuck in traffic (due to a catastrophic accident) find each other in the parking lot of a highway, meet, and exchange gifts! 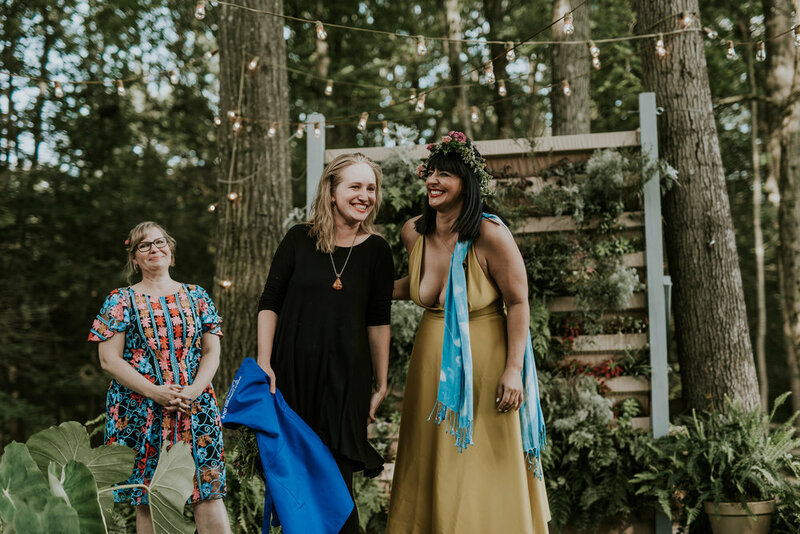 I was moved when Nicole Hutnyk, of Rabbit Rabbit Crew, explained that her gift was going to be glasses for each guest with the word kismet on them. She explained that something special brought us together to create our event. Having Nicole’s planning and logistical expertise throughout the process definitely allowed us to be more present on the day of the dinner. This year we chose to work primarily with Cyanotype, a simple form of direct photography that yields a blue solar impression. Not only did we love the cyan palette, but the materials — water, sunlight, and air — are the perfect expression of summer itself. We started early in the summer, creating a series of cyanotypes with our friend, artist Ken Jones Jr. Together we experimented with very large-scale fabric prints and works on paper. Later, Ken created a backdrop for our formal portrait area. 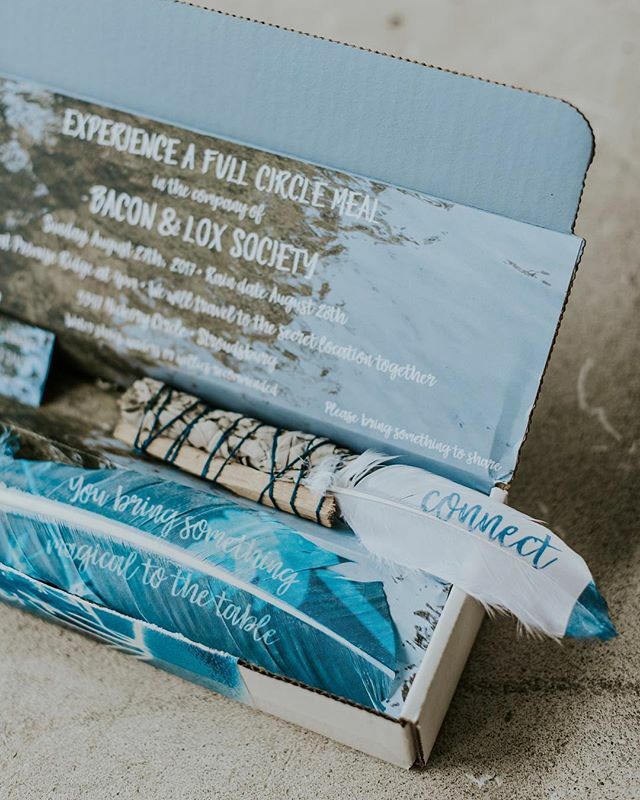 Our guests’ first glimpse of this cyanotype style was the digital “Save the Date,” which featured my painting of a “cyanotype” feather. We followed that up with a set of printed feathers that said Connect and You bring something magical to the table. These were part of a lovely smudgestick set, perfect for “making a space” for celebration. 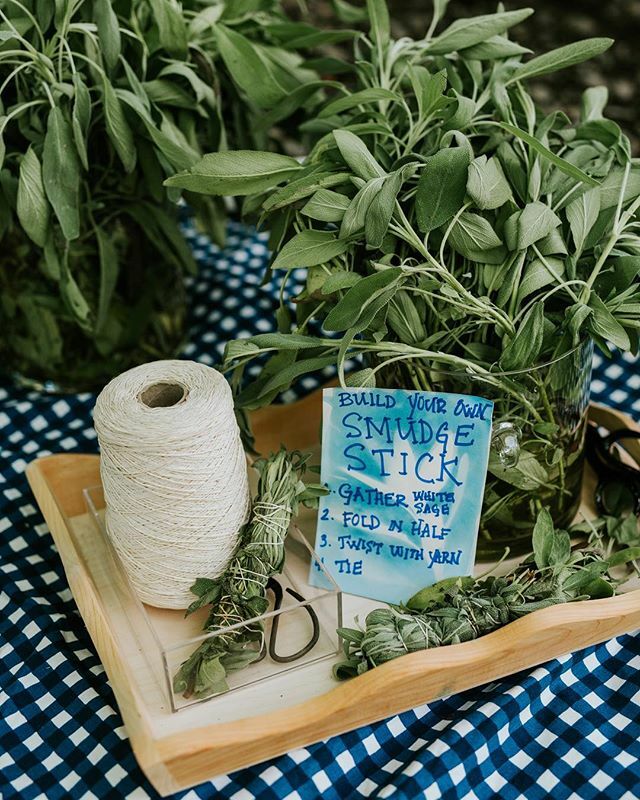 Smudgestick Station by Ken Jones, Jr. 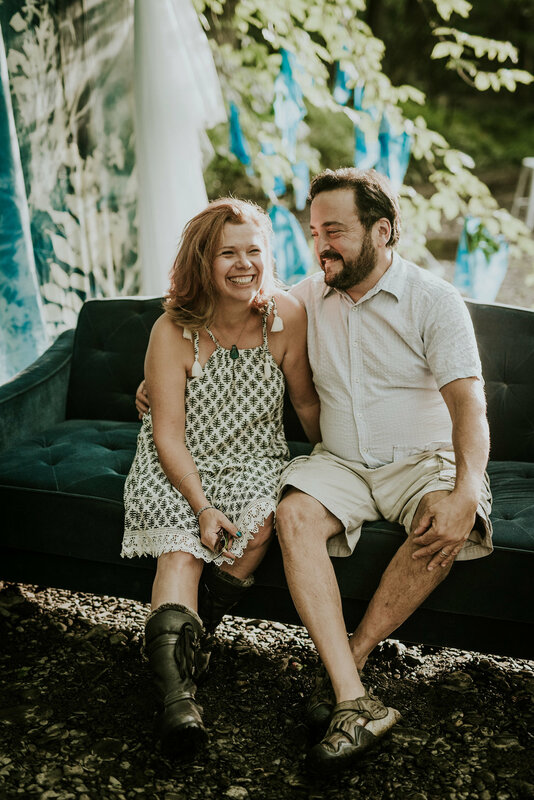 In addition to the invitations, we also incorporated cyanotypes onto napkin menus, and the sail of our “boat.” Guests loved the theme, too, and incorporated it into their “gifts” and outfits. Cyanotype pants, button-downs, T-shirts, and more were created (and worn!) just for the occasion. Guests really became a part of the art. We also explored the Eagle as a Native American symbol, owing to my being a part of the Cherokee Nation, and the Full Circle concept being Cherokee in origin. We used feathers and eagle wings throughout the event, and were thrilled when a bald eagle circled overhead during our pre-creek festivities, before swooping down into the creek at the end of our meal. 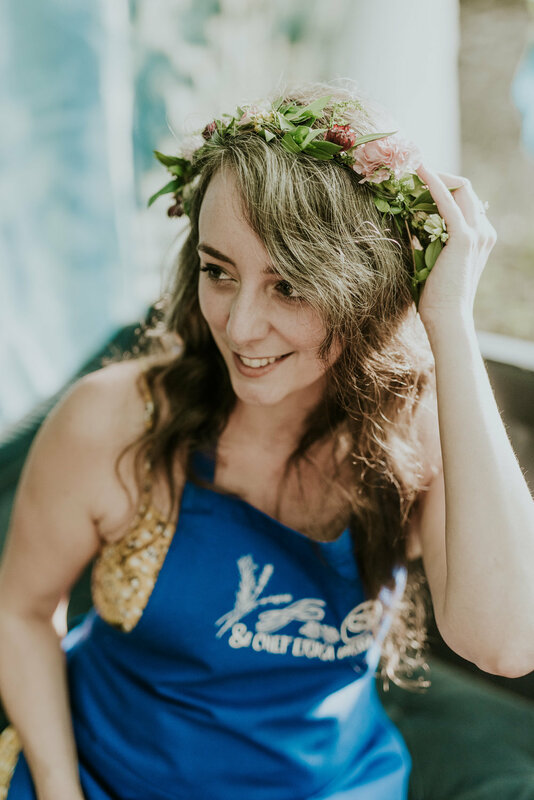 During our pre-creek cocktails, Sara Petryk — of Allium Floral and Event Design — hosted a floral crown workshop. This group activity at the beginning of the event made for an easy ice-breaker and bonding experience for our attendees. 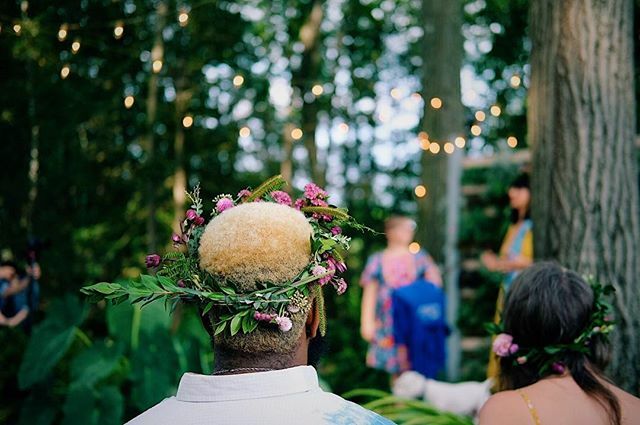 The handmade woodland crowns also gave every attendee something to wear for their formal portrait gifted by M2 Photography when we entered the creek. We loved that two of the chefs (Rothman and Stirbys-Benefico) paid homage to the “Bacon & Lox” with their course offerings, and Chef Urso included candied rose petals from her garden for a delicious garnish on her wonton dessert. It wouldn’t be a Full Circle Meal if we didn’t all gather together in the water, holding hands in a circle! I love this twist on a Quaker grace — one person starts by squeezing the hand of the person to their right, and that person squeezes the hand on their right, and so forth...the love and warmth travels through everyone present, full circle. This year, we took time to acknowledge those who weren’t with us, and in harm’s way, sending our loving vibes their way, too. The entire creative process and every decision therein — from what went on the menu to the enamel dishware we ate it off of — was informed by our desire to truly leave no trace. At the end of the night, everyone pitched in to break down the communal table and get everything out of the creek before the last light was gone. 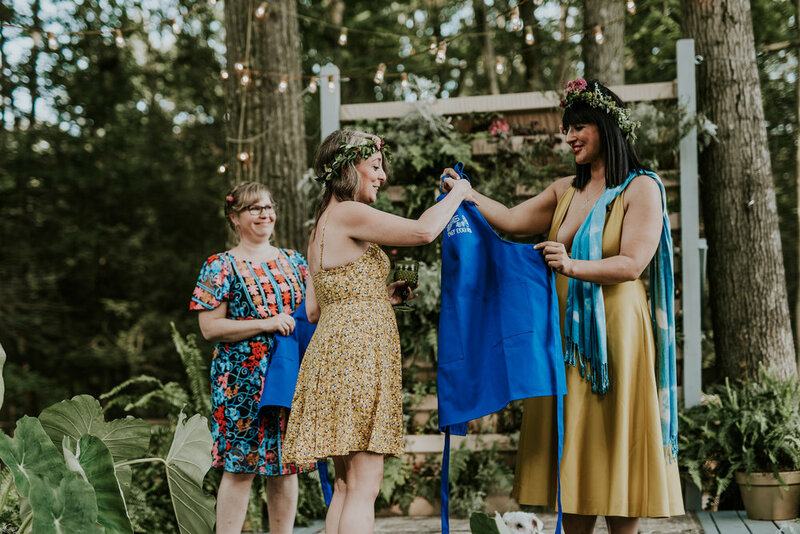 Just like last year, each guest was asked to bring “something to share.” Along with the major event pieces like furniture, florals, and food, guests brought local beer, hand-painted cyanotype cookies, prints, and haikus. 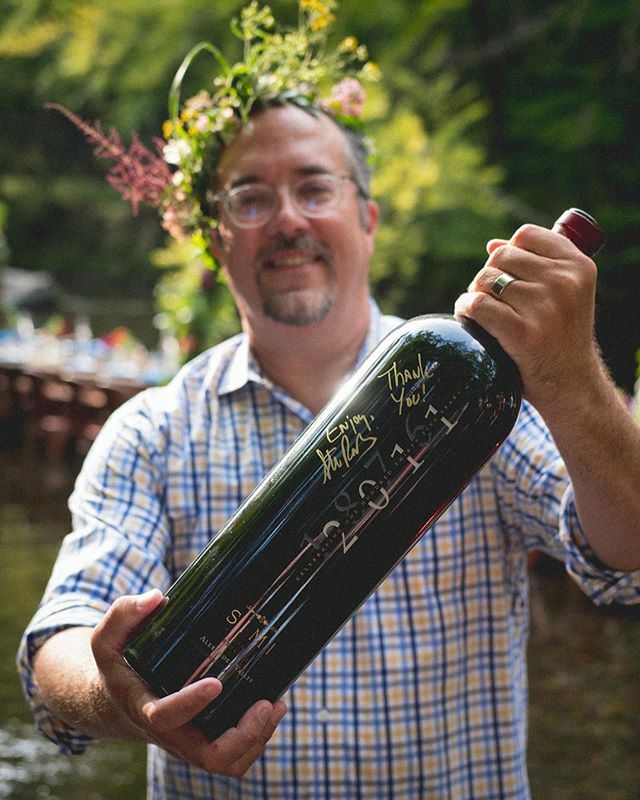 Photographer Rob Yaskovic gifted attendees with one of his water portraits if they were brave enough to submerge themselves at the end of the night. We were excited to have M2 Photography and Stagger Films formally document the event, as well! An added bonus of inviting a bunch of artists to dinner is that several of our guests made their own beautiful photographs of the evening, and have shared them freely with the group! … Last night was magical. In a time when the world seems to be upside down, taking responsibility for healing and celebrating our differences as similarities seems to be such a noble effort. I applaud our hosts for being true “Collaboration Artists” and bringing together such a wonderful group of people who can take inspiration from last nights events and spread the cultural “mashup” intentions to bring people closer together to our all circles of influence. One thing that I have learned over the years is that the spirit of one can move many. Alisa and Heather have proven the truth in that statement. I wish the everyone can have their own version of “The Bacon & Society” and celebrate in the ultimate five star venue-“nature." What a great evening. These incredible individuals and businesses helped make the Full Circle Meal as magical as it was. BizBash Shows Us Some Love!